Recap of my first anime convention (Metrocon 2016) + cosplay photos! Back in June, I made a list of things to do before summer ends, and that list included attending an anime convention in cosplay. MISSION ACCOMPLISHED! I spent July 21-24 in Downtown Tampa at Metrocon, where I met some cool people and had a hella awesome time. Day 1 was pretty chill for me. On Thursday afternoon, I found myself squished into an overly packed vehicle as we headed downtown. I didn’t have a convention pass for Thursday, so instead of going inside the convention center, I walked around downtown and chilled on some benches outside the convention center for a couple of hours. It was a pretty good spot for playing Pokemon Go, and I caught several Magikarp and a Snorlax before sunset. After Artist’s Alley closed up for the day, I met up with my friend Heather, who was selling art at the convention. We hit up some food trucks for a really late dinner before going to sleep. 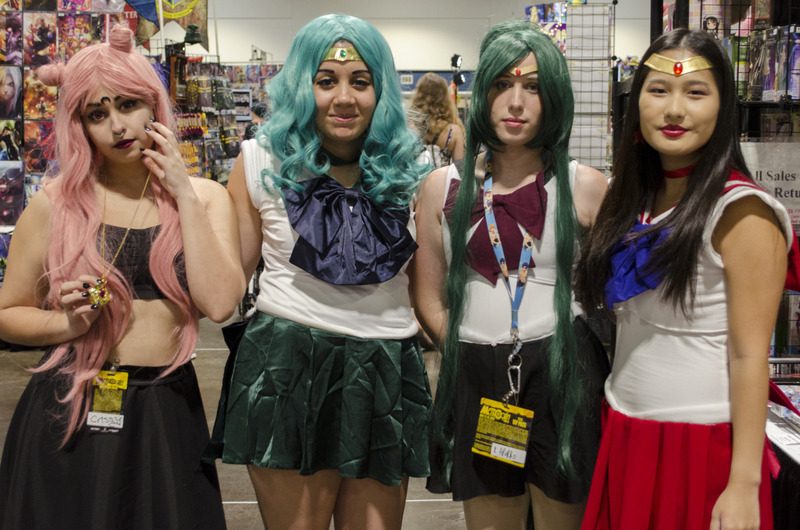 Friday was really exciting for me because it was the first time I wore my completed Sailor Mars cosplay. I learned a valuable lesson that morning: always give yourself extra time to put on makeup and get dressed if you’re cosplaying, and do a photo check before you leave. I pinned the bows and collar to fuku for convenience but found myself annoyed by floppy bows and visible safety pins. Luckily, I had gorilla glue in the condo and was able to properly attach everything during our lunch break. I was really surprised when so many people stopped me for photos during the convention! I did most of the Sailor Mars cosplay by hand in two nights during homecoming spirit week when my sewing machine broke. There are lots of mistakes, and the stitch work is sloppy. 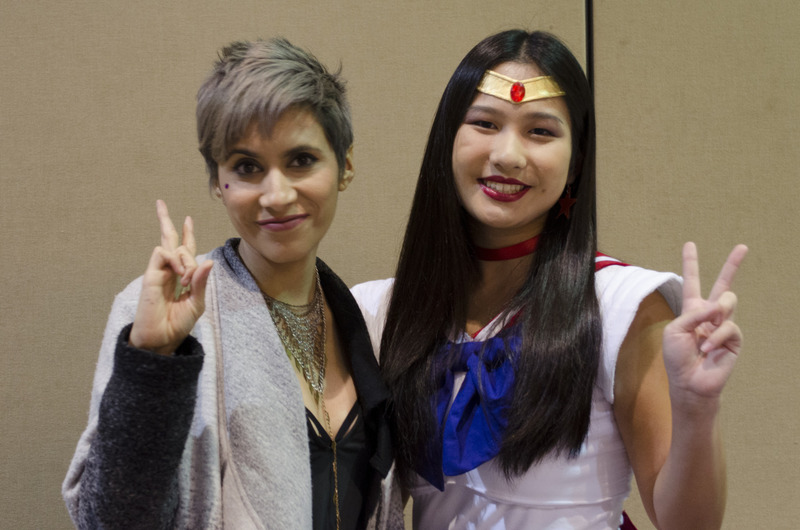 The highlight of my day was meeting Cristina Vee, the voice actress for Sailor Mars! I’m so glad I had a chance to touch up my cosplay before this photo. I also got a photo with these awesome ladies in their badass cosplays. I also watched the annual chess match, which is basically a cosplay fight show with a storyline. I loved the theatricality of it all, but to be honest I didn’t know most of the characters and ended up lost in the middle. Saturday is known as the “big day” at Metrocon. There were certainly a lot more people than Friday. Still, I was a bit underwhelmed by the crowd (or lack there-of). Heather told me this year was a lot quieter than usual because Metrocon 2016 stopped being an open convention, meaning that everyone was required to pay even if they aren’t interested in panels. This change definitely hurt the artists, most of whom barely broke even because in previous years there were lots of attendees to came to Metrocon for free just to buy art rather than to attend panels. Nonetheless, I had a great time roaming the convention center as San from Princess Mononoke. I don’t want to post all of the pictures here because this post will take forever to load, but you can see the entire Princess Mononoke photoshoot on Tumblr. 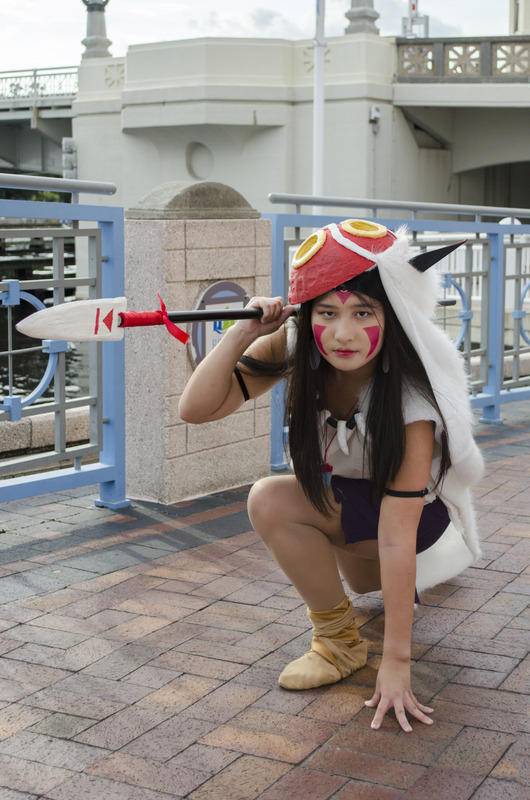 Click on the photo to see my Princess Mononoke cosplay photos! On Saturday, I also checked out Metrocon Idol contest and the Anime Music Video contest. It’s amazing how well the idol contestants know the Japanese lyrics to anime themes. I barely know English songs! I met up with an old friend, Mikey, during the AMV contest, which I also really enjoyed. After that, I took some more photos, talked to people in cool cosplay, went to a Disney sing-a-long with Heather and Chloe (another friend, who painted my face in the morning), went on a scavenger hunt (we didn’t win) and watched an epic fire show! 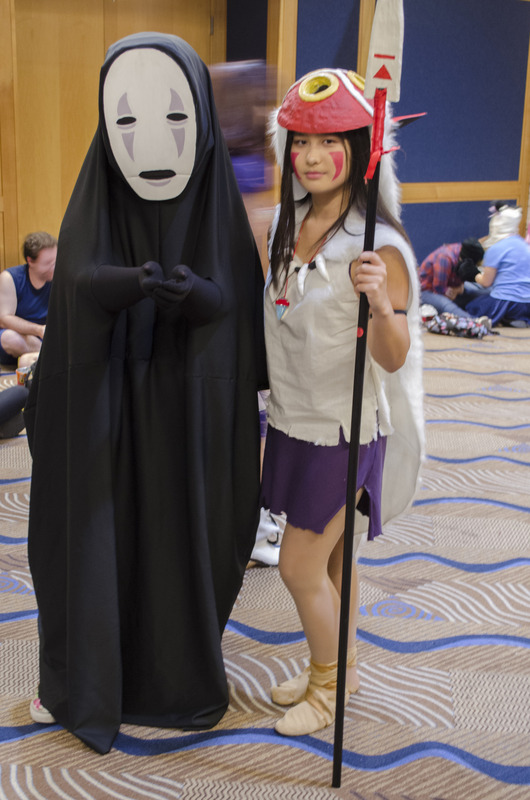 I also got a photo with No Face! Sunday was the last day at Metrocon 2016, and I was absolutely exhausted! The only event I attended was the cosplay contest, which features some absolutely amazing costume work. There was an incredibly authentic Rumpelstiltskin cosplayer, a Howl with a gorgeous detailed jacket and lots of light-up dresses. After the cosplay contest, I spent the rest of the day behind Heather’s art booth. The art booth is a great place for people-watching and socializing. I’m really glad I decided to put on my Sailor Mars cosplay again that morning, because I met an adorable little boy dressed up as Tuxedo Mask. His mom told me he’d been following my all day and asked for a photo! If you could cosplay any character, who would you choose? This looks like so much fun. Your costumes are awesome. LOL about the skirt! Thank you! I had so much fun pretending to be two of my favorite characters! 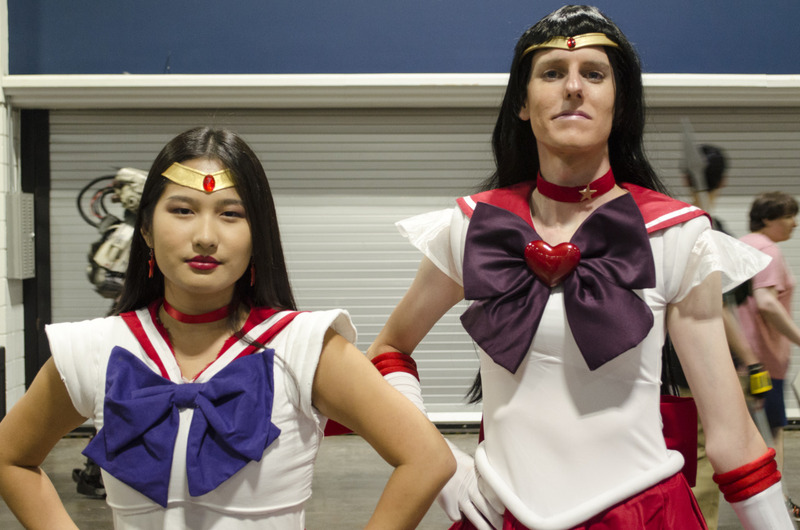 Funny story: I actually didn’t realize that guy was a guy when I said, “Looking good Sailor Mars!” from afar. He stepped closer and replied, “Thanks, but I couldn’t do the earrings,” in a deep voice. I was so shocked! He really did look like a tall, skinny girl from afar! I have a few cosplays in mind for future conventions. I’m slowly working my way toward more complex designs. I’ll cosplay a Disney character one of these days. Thanks for sharing this post with us. I am little bit interested to get more information about metrocon. I like to share my opinion on metrocon.sewing machines are pretty basic but do the job quite well if you are a beginner. Other machine can be much more advanced with features a newbie will never even need. The mistake could be made that a lot of money is spent on such a machine where most of the features are not even required. Thanks for sharing this post. I am very interested in convention . I would like to share my opinion on convention. Many shoppers think of the neighborhood House Depot and Lowes relating to cabinetry. This, nevertheless, solely provides you entry to a normal design to your kitchen plan vs. a custom-made, customized type and kitchen format. When corporations journey on the trail in the direction of having an internet site for his or her enterprise, they should contemplate numerous elements. They need to analysis the web site designer they suppose they might need to use to strive to make sure that they are going to have their firm correctly mirrored within the net design. I have a few cosplays in mind for future conventions. I’m slowly working my way toward more complex designs.